This is the first reported isolation of avian influenza virus (AIV) from emu in China. An outbreak of AIV infection occurred at an emu farm that housed 40 four-month-old birds. Various degrees of haemorrhage were discovered in the tissues of affected emus. Cell degeneration and necrosis were observed microscopically. Electron microscopy revealed round or oval virions with a diameter of 80 nm to 120 nm, surrounded by an envelope with spikes. The virus was classified as low pathogenic AIV (LPAIV), according to OIE standards. It was named A/Emu/HeNen/14/2004(H9N2)(Emu/HN/2004). The HA gene (1683bp) was amplified by RT-PCR and it was compared with other animal H9N2 AIV sequences in GenBank, the US National Institutes of Health genetic sequence database. The results suggested that Emu/HN/2004 may have come from an avian influenza virus (H9N2) from Southern China. Avian influenza (AI) is a contagious viral infection of many avian species worldwide including domestic poultry, wild and exotic birds, shore birds and migratory waterfowl. Avian influenza virus (AIV) is an enveloped RNA virus with a helical nucleocapsid and eight segments of single-stranded negative-sense RNA. The envelope contains the haemagglutinin (HA) and neuraminidase (NA) proteins, of which there are currently 15 HA (H1-H15) and 9 NA (N1-N9) types [22, 1, 21]. Serial passage in the laboratory can result in a highly pathogenic avian influenza virus (HPAIV) . The virus has been isolated from various species of wild and domestic birds; the effects of infection can range from inapparent to acute disease, characterised by high morbidity and mortality. Lesions vary depending upon the strain of the virus and the species affected. Wild aquatic birds, such as waterfowl and seabirds, are important reservoirs for AIV . In ostrich, AIV can cause diarrheoa, secretion in the nasal cavity, dyspnoea, tracheitis, pneumonia and death [2, 9]. To date, AIV have been isolated from ostrich almost all over the world including South Africa (H7N1, H5N9, H9N2); Zimbabwe (H5N2); Holland (H5N9); America (H5N2, H4N6, H7N1, H7N3, H10N4) and Canada (H7N1) [15, 3, 4, 6, 11, 14]. Since 1990, China has imported ostrich and emu from America, Europe and Africa. This is the first report of AIV (H9N2) in emu (Dromaius novaehollandiae) in China. In HeNan province, there were 40 four-month-old emu on a farm which consisted of a semi-open house and an open paddock. The adult breeders were located on another farm that was 50 kilometres away. Many of the young emu became ill. The clinical signs included cyanosed crests, depression, torticullis and closed eyes, drooped wings, inappetance, swollen eyelids, lachrimation and nasal discharge. The course of the disease was three to seven days, with morbidity at 60.25% (25/40) and mortality rate at 12.5% (5/40). Gross pathological changes included hyperaemia and haemorrhage in mucous membranes, oedema and congestion in the lungs, swelling and congestion in the liver, haemorrhage in the epicardium, swelling of the kidneys, uric acid sediment in the renal tubules and ureters, oedema and haemorrhage in the mucous membrane of the Bursa of Fabricius, and widespread haemorrhages in the gastrointestinal tract. Microscopically, there were hyperaemia and haemorrhage in the lungs (Figure 1a), desquamation of bronchial mucous membrane, haemorrhage among cardiac muscles and necrosis of cardiac muscle. In the brain (Figure 1b) local liquefactive necrosis, satellitosis, neuronophagia, perivascular cuffing, gliosis and haemorrhage were evident. Tissue samples of the brain and spleen were collected from diseased emu for virus isolation. Pathological changes observed by light microscopy in lungs and brains of diseased emu. Hyperaemia and haemorrhage in the lung (Haematoxylin and Eosin; original magnification 100×). Satellitosis, neuronophagia and perivascular cuffing in the brain. (Haematoxylin and Eosin; original magnification 250×). One aliquot of each of the brain and spleen tissue samples collected from the diseased emu was cultured for aerobic and anaerobic bacteria. The other aliquot was weighed and homogenized in PBS (pH 7.2, with 1000 IU/ml penicillin and 1000 IU/ml streptomycin sulfate) to make a 10%W/V suspension. Large pieces of tissue were centrifuged at 3000 g at 4°C for 15 minutes and the supernatant was harvested. Ten-day-old specific pathogen free (SPF) Leghorn embryonated chicken eggs (Institute of Experimental Animals, China Agricultural University) were inoculated with 0.2 ml of 10% tissue suspension via the allantoic cavity. Eggs were incubated in a stationary incubator at 37°C with 55% relative humidity and candled for embryo viability for 24 to 96 hours. Embryos that died within 24 hours were discarded. Allantoic fluid was collected aseptically from embryos that died more than 24 hours post-inoculation (PI). Up to two serial blind passages were made. All of the harvested allantoic fluids were tested for the presence of haemagglutination activity by the haemagglutination (HA) test. A haemagglutination inhibition (HI) test was performed if the HA test was positive. At the same time, these allantoic fluids were tested for bacterial contamination by routine procedures. The resultant virus isolate was incubated in Vero cell monolayer in modified Eagle medium supplemented with 10% foetal bovine serum, 1000 IU/ml penicillin and 1000 IU/ml streptomycin sulfate. Up to four serial passages were made. If a cell pathologic effect (CPE) was not found within 96 hours, 0.1 ml 0.25% trypsin was then added into the culture medium of other cells with the same passage level, and culture was continued for 96 hours [17, 20]. All of the allantoic fluids were tested by haemagglutination inhibition (HI) test, using Newcastle Disease (ND) virus and Egg Drop Syndrome 1976 (EDS-76) virus standard positive sera (China Institute of Veterinary Drug Control, Beijing, China), respectively. Haemagglutinin subtype of the virus was confirmed via b-microtitre method with H1-H15 standard positive sera (China Institute of Veterinary Drug Control) and the activity of NA was also determined. NA tests were carried out as previously described [5, 20, 13] using standard positive sera (H5N3, H7N1, H9N2) supplied by China Institute of Veterinary Drug Control. Allantoic fluids were centrifuged at 10,000 g for 30 minutes, at 4°C. The supernatant was ultracentrifuged at 35,000 g for 30 minutes at 4°C. The resultant pellets were resuspended with PBS. Samples were applied to copper grids for five minutes, negatively dyed for two minutes with 2.5% phosphatungstenic acid, and then observed under the electron microscope . Forty-eight six-week-old SPF Leghorn chicks (Institute of Experimental Animals, China Agricultural University) were randomly divided into three groups. The first group was inoculated with 0.1 ml 10% allantoic fluid in PBS by wing vein injection. The second group was injected with PBS as control, and the third group was injected with allantoic fluids of normal ten-day embryonated SPF chicken eggs (Institute of Experimental Animals, China Agricultural University). Feed and water intakes were recorded from day two to day ten PI. Cloacal swabs were collected and virus isolation from swabs was performed using the same procedure as already described for the tissue samples. Twenty-four seven-day-old emu (Institute of Experimental Animals, China Agricultural University) were divided into three groups of eight animals and were used to carry out a similar experimental test as described for the SPF chicks [5, 13]. The amplification was carried out in a total volume of 50 μl. The reaction mixture contained 5 μl of 10X PCR buffer (100 mM Tris.HCl, pH 9.0; 500 mM KCl; 1 mg/ml BSA), 5 μl of 25 mM MgCl2, 2 μl of each dNTP (2 mM, Pharmacia, Uppsala, Sweden), 10 pmol each of forward primer and reverse primer, 2 μl (1U) of Taq DNA polymerase (Perkin Elmer-Cetus, Norwalk, CO, USA), spacing 2 μl of cDNA; the final volume was adjusted with sterile MilliQ water. In vitro amplification was performed in a DNA Thermal Cycler (Perkin Elmer-Cetus) using the following thermal profile: denaturation at 94°C, annealing at 54°C and extension at 72°C, for one minute each. After 30 cycles, the last step of extension was prolonged to 10 minutes. The RT-PCR products were checked by 0.8% agarose gel electrophoresis and examined under UV light. RT-PCR products were purified with a QIAquick PCR Purification Kit (QIAGEN, Germany), ligated into vector pMD18-T (TaKaRa, Dalian, China), and the resulting recombinants were used to transform competent Escherichia coli JM109 (TaKaRa). The bacterial clones which showed a resistance to ampicillin were collected and plasmids were extracted according to standard protocols. After BamHI and HindIII digestions, the plasmids were examined by electrophoresis, and then sequenced by Bioasia company (Beijing, China). The nucleotide sequences of the HA genes were compared with those of the viruses listed in Table 1. Sequence comparisons were performed using DNA Star (version 4.0), and a phylogenetic tree was constructed using TreeView. The brain and spleen tissue samples cultured for aerobic and anaerobic pathogens did not yield bacterial pathogens. The tissue suspensions were inoculated into the allantoic sacs of embryonated SPF Leghorn chicken eggs. The allantoic fluid from the first passage had haemagglutination activity (HA). The embryos developed haemorrhages. The isolates caused death of the embryos at the fourth passage. The highest recorded HA titre of the allantoic fluid was nine log 2. Most of the embryos died at 44 hours to 48 hours PI. The isolated virus was inoculated into VERO cells, but CPE was not observed. However, after adding trypsin the cells became rounded, shrunken and died. Approximately 75% of the cell sheet displayed CPE at 72 hours. The positive antisera to Newcastle Disease virus and to egg-drop syndrome virus did not inhibit the haemagglutination activity of the isolated viruses. The isolates were defined as H9N2 by testing all the haemagglutinin and neuraminidase subtypes. The virions were round or oval, with a diameter of 80 nm to 120 nm. 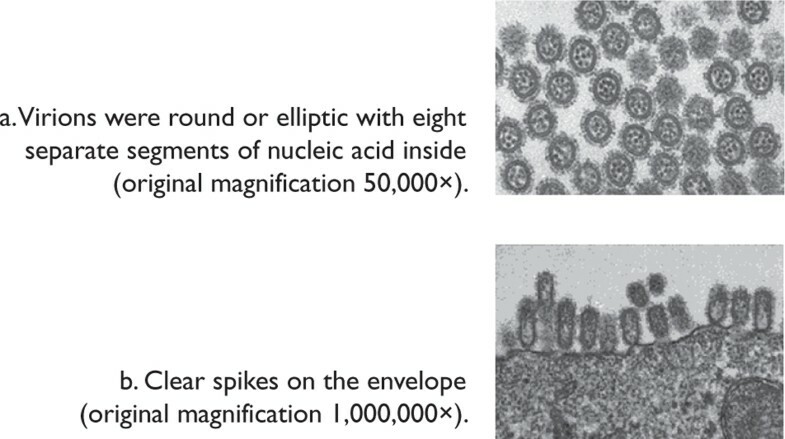 The virion was enveloped and the spikes on the envelope were seen clearly (Figure 2a and 2b). Typical avian influenza virions were observed by electron microscopy. Forty-eight six-week-old SPF chicks were observed for ten days PI. Each of the first group of 16 SPF chicks was inoculated intravenously with 0.1 ml allantoic fluid in PBS. The mortality was 6.25% (1/16) at 10 days PI. Some birds were depressed, had ruffled feathers between days 3 and 5 PI, reduced feed and water intakes, and the positive virus isolation ratio of the cloacal swabs was 87.5% (14/16). Each of the second group of 16 chickens inoculated intravenously with 0.1 ml PBS remained healthy, as did the third group of 16 chicks inoculated with normal allantoic fluid. The first group of eight emu, inoculated intravenously with 0.1 ml each of 10% allantoic fluid in PBS, had a mortality rate of 12.5% (1/8) during 10 days of observation. Feed and water intakes declined 50%, and the virus was isolated from seven out of eight cloacal swabs (87.5%). All of the birds in the second and the third groups remained healthy (100% survival). According to the criteria of the Office International Des Epizooties (OIE), the isolate was identified as a low pathogenic avian influenza virus (LPAIV). According to the denomination principles of the international influenza virus system the isolate was identified as: A/Emu/HeNen/14/2004(H9N2) (Emu/HN/2004)[22, 6]. The RT-PCR products were checked by agarose gel electrophoresis. Only one clear band, which was 1683 bp, was obtained. After BamHI and HindIII digestions of the recombinant plasmid of the HA gene cDNA and pMD18-T, two DNA bands appeared on electrophoresis. One band was -2650 bp, which was the pMD18-T vector, and the other band was -1683 bp, which was the target gene. The Emu/HN/2004 HA gene sequence showed high nucleotide homologies with other H9N2 AIV HA gene sequences published (Table 2). The HA amino acid cleavage site of Emu/HN/2004 was apparently different from the cleavage site of other AIV. The HA amino acid cleavage site of Emu/HN/2004 was P-A-R-L-S-R-G-L-F, while in other H9N2 AIV it was R-S-S-R-G. This difference would suggest that there was already certain changes in the HA amino acid of Emu/HN/2004 (H9N2) [5, 19, 20, 8, 12, 13]. From the phylogenetic tree constructed, nucleotide sequence homology of Emu/HN/2004 was highest with Ck/GX/99, Ck/YN/2000 and Ck/SH/2001. This would indicate that Emu/HN/2004 evolved from AIV(H9N2) of chicken origin. According to the OIE standards for AIV, the virus isolated from emu was pronounced as a low pathogenic avian influenza virus (LPAIV) with a designated name A/Emu/HeNen/14/2004(H9N2)(Emu/HN/2004). This virus is the first LPAIV (H9N2) isolated from emu in China. Analysis of the HA gene sequence of Emu/HN/2004 showed that the virus was most similar to Ck/GX/99, Ck/YN/2000 and Ck/SH/2001, which indicated that Emu/HN/2004 probably evolved from chicken AIV (H9N2). The pathogenicity and transmissibility of influenza viruses vary among different hosts and this clinical variability may cause difficulty in the diagnosis of AIV infections. Ratites are susceptible to AIV infection. They can transmit the virus, in its virulent form, to other birds. The results obtained in the present study demonstrated a high degree of variation of influenza virus infections among different avian species. These findings represented an important issue for consideration in the migration of ostriches and in the establishment of regulatory guidelines for diagnosis of ratite AIV infections. The surface structural protein HA is the main determinant factor of AIV pathogenicity. The cleavage of HA into HA1 and HA2 is a prerequisite for generalised infections. The amino acid sequence around the cleavage site is the main determinant factor for AIV virulence. The difference between highly pathogenic AIV and low pathogenic AIV subtypes is characterised by the presence of many alkaline amino acids at the cleavage site of HA gene, while low pathogenic AIV isolates contain none, or only one alkaline amino acid. For Emu/HN/2004, the amino acid sequence around the cleavage site was -P-A-R-L-S-R-G-L-F-, which was indicative of a low pathogenic AIV. However, the cleavage site of Emu/HN/2004 was different from the cleavage site of other H9N2 AIV (-R-S-S-R/G-). This suggests that there is already some changes in HA amino acid of Emu/HN/2004 (H9N2) compared to other chicken H9N2 AIV [23, 21, 18, 16, 10]. The Emu/HN/2004 may have acquired mutations in the HA gene during the transmission from chickens to emu. This work was supported by the Natural Science Foundation of China (project no. 30371062) and the Doctoral Foundation of the Chinese Ministry of Education (project no. 20020019006).